Thanks to the lentils, this vegetarian soup is packed with hunger-squashing protein. 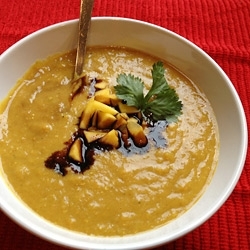 The mango provides Vitamin C to help boost your immune system, while the balsamic vinegar adds a tangy flavor that makes this soup extra delicious. Coat the base of a large pot with canola oil spray and sauté red onion over medium heat, stirring until browned and soft – about 8-10 minutes. Toss in garlic, ginger, curry, cayenne, salt and pepper, and cook for 1 minute. Add carrots, lentils and water. Cook, stirring occasionally, until lentils thicken, approximately 25-30 minutes. Add mangoes, tofu, and balsamic vinegar. Puree with emersion blender until smooth, or pour into a blender and puree in batches. Pour soup back into the pot and reheat for 2-3 minutes before transferring to serving bowls. Garnish with cilantro and a drizzle of balsamic if desired.